About half of victims of this earthquake were elderly people with sixty-five years old or more. This means that elderly people are physically weak in protecting themselves from disaster. At the same time, it suggests that the aging society of Tohoku has already advanced. 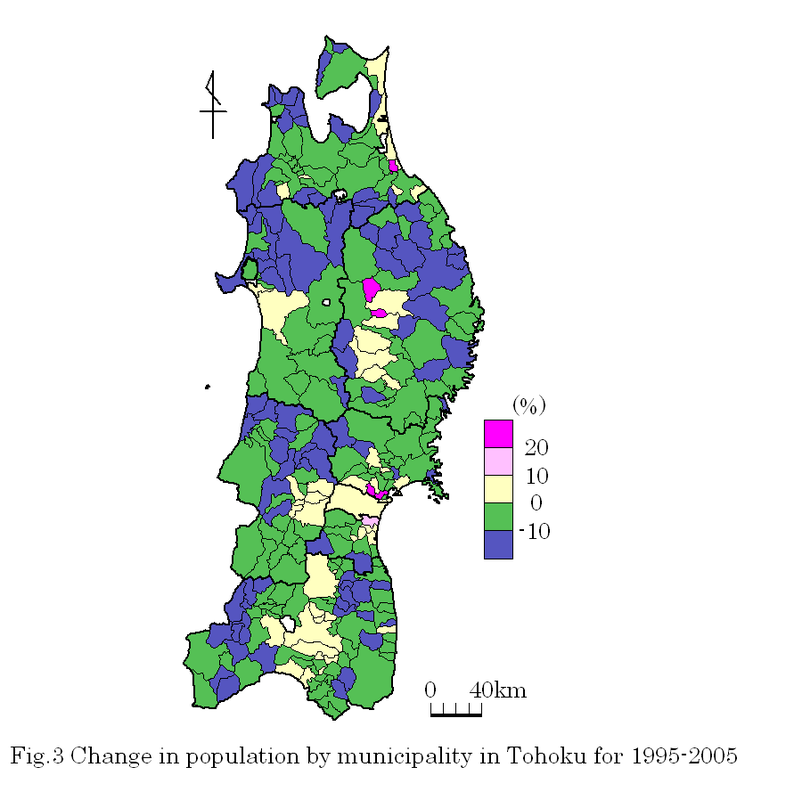 Fig.1 and Fig.2 show the distribution of population and percentage of people with 65 years old or more by municipality in Tohoku in 2005, respectively. 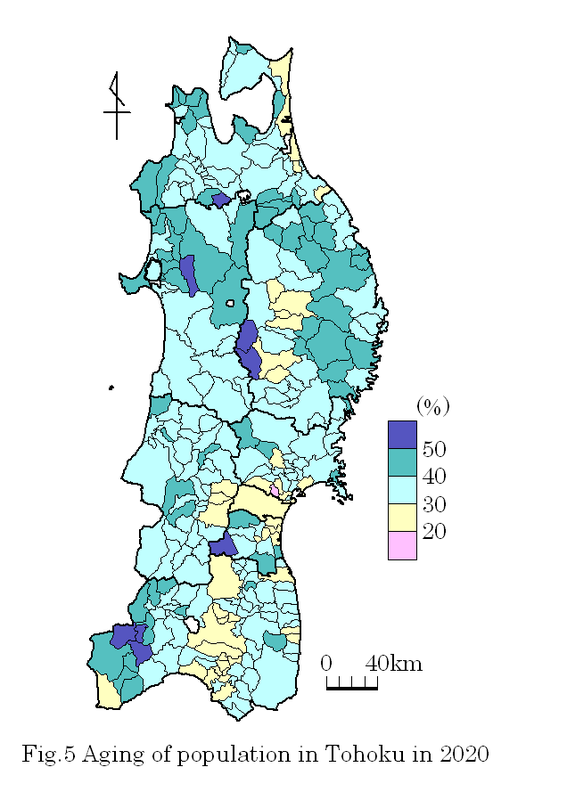 Although there are several agglomerations of population especially in the southern Tohoku such as Sendai, Koriyama, Fukushima and Yamagata metropolitan areas, the population is dispersedly distributed overall. At the same time, the aging of population has already advanced. As of 2005, the percentage of people with over 65 years old was twenty percent on average of the country. 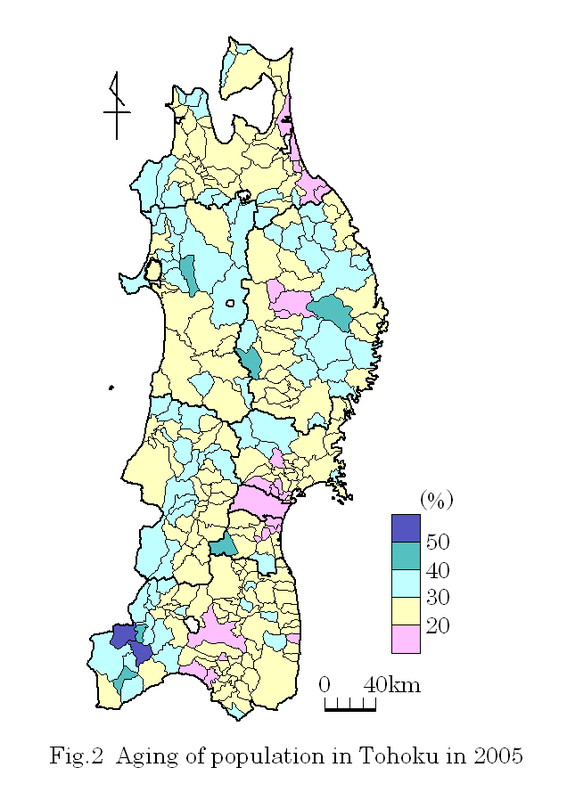 In Tohoku the percentage in 262 municipalities (92 percent of the total) was over twenty percent. 85 municipalities among them showed over thirty percent. Aging of society generally accompanies the decrease of population. Fig.3 shows the change of population by municipality from 1995 to 2005. 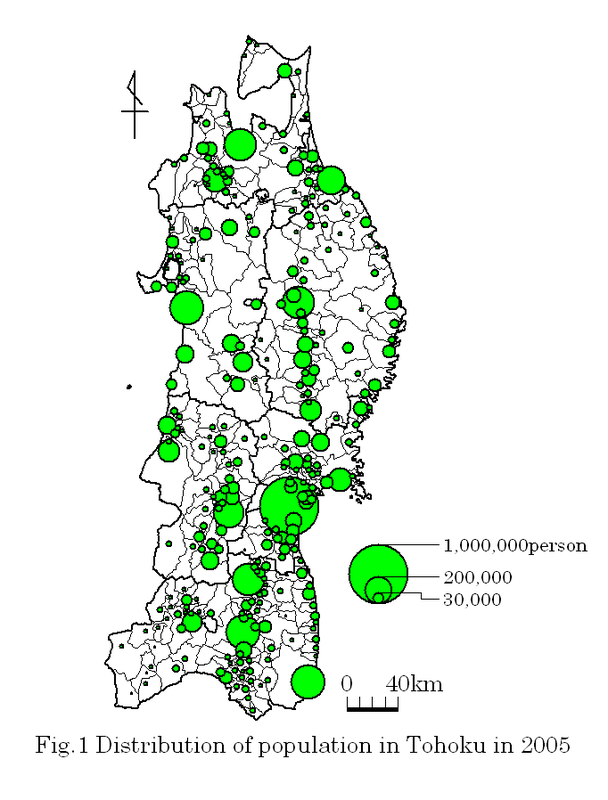 It is easily understood that the depopulation area has extended all over the region excluding large metropolitan areas such as Sendai. We must challenge the restoration of Tohoku from this disaster. For this it is necessary to anticipate the situation of future. Expectation of population in the future is fundamental information. Future population expectation was issued by the public population statistical institutes. Here, based on the statistics presented by Statistical Information Institute for Consulting and Analysis, we tried to examine progress of aging and population change for the next decade. Fig. 4 shows the anticipated change in population by municipality for 2005-2020. The number of municipalities with increase in population will be limited only seventeen. The percentage to all municipalities is only six percent. Furthermore, forty percent of all municipalities will experience the population decrease of 20 percent or more. In coastal areas of Pacific Ocean the population decrease is anticipated to proceed more than the situation predicted in Fig.4. Since this disaster destroyed local economies in these areas, the opportunities of job are thought to be decreased especially for young generations. And then, it will induce the outmigration of young generation. Fig.5 shows the situation of aging in Tohoku in 2020. As a whole the percentage of people with over 65 years old will increase by 8 percent for 2005-2020. In 73 municipalities (26 percent of the total) the above percentage will be over 40 percent. A large part of them are municipalities in mountainous areas and coastal areas far from major cities. Furthermore, this aging trend may advance faster than the anticipation for the coastal areas of Pacific Ocean suffered tremendous disaster. Statistical Information Institute for Consulting and Analysis ed. 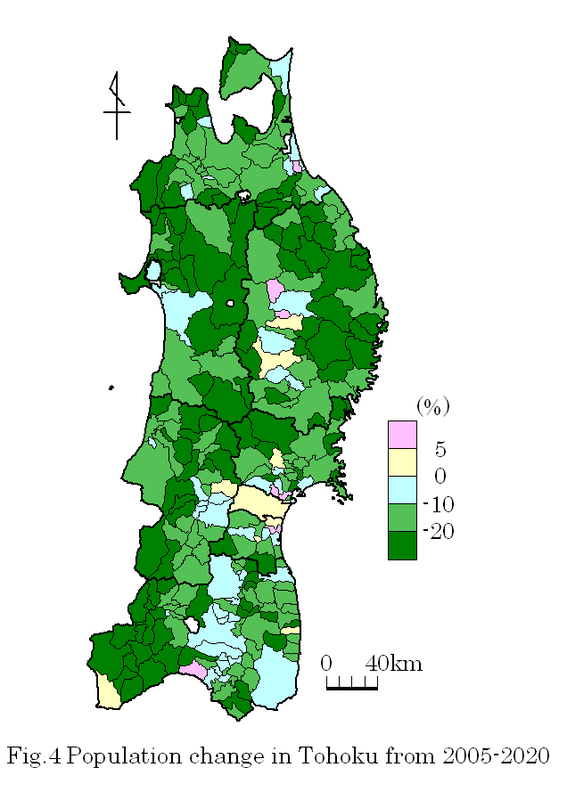 (2007): Shichoson no shorai jinko(2005-2035)( Population of municipality in the future:2005-2035),Japan Statistical Association.